Watch FA Cup goal of tournament contenders here. Follow Euro cup finals here. Wenger - you'll know my future by "Wednesday or Thursday"
That's a conversation for next week. It's time for us to say goodbye. The big question is: will he stay or will he go? Chelsea manager Antonio Conte: "I think the first goal was very strange. The first half we didn't start well, we didn't have the right approach and we suffered in first 25 minutes. "We started to play better in the second half and the red card was decisive. "I didn't see the incident on the TV and it was difficult to understand. "The first goal, the player had his hands attached to the ball with two hands. Offside or not is not important. "Arsenal started very well with great determination. They surprised us a bit but I repeat our first 25 minutes weren't good. "At our best moment, the referee decided to give the red card. "There is dissapointment for the final result but it can happen and there was a lot of pressure. Victor Moses has been good and played an important season. "Our season was incredible to win the league in this way, it was great but now its important to look forward and to restart". I'm proud of Arsenal. I really am. You wouldn't have found too many Arsenal fans last night who would have expected them to win today, given the players that were missing. You wouldn't have expected Chelsea to be as poor as they were, but you've got to take advantage of that. Eden Hazard has been brilliant all season, but he didn't turn up today. More from Chelsea keeper Thibaut Courtois: "I wouldn't say we were surprised because for the last four or five games in the league, Arsenal upped their game so we expected a hard game. "When you score, you get momentum and can build on that. We tried but obviously not enough. "If you play final you build up to that and maybe they did that more because we already won the league." Chris09: Delighted for Arsene Wenger..the man well and truly deserves it for what he has done for. Jay Graham: Made up for Wenger. The best manager in Arsenal history deserves better from rival fans let alone his own. Saggydaddy: Wenger very emotional and talking like he's definitely going. Arsenal were really intent. They went after Chelsea. And Chelsea were too slow. Arsenal deserve credit because they were under huge pressure, their manager was under huge pressure, and they've done it. The sending off of Victor Moses was a great decision because diving is a huge thing over the last few months, and he made a brave call in a big game. It was cheating by Moses. Chelsea goalkeeper Thibaut Courtois: "We are obviously disappointed but I want to say congratulations to Arsenal. They played a good game. "The first goal should never have been allowed - it was clearly a hand ball and then Ramsey was offside because he he was interfering in play. "After that goal, we tried to play but they deserved it. "Then we went down to 10 men and the red card was correct. Victor Moses doesn't need to apologise." The impressive thing about the Arsenal team performance today was off the ball. They have always been good on the ball with Ozil and Sanchez but off the ball, they looked like they have spent all week in training working out how they are going to press Chelsea. Chelsea's Nemanja Matic for his wonder strike against Tottenham in the semi-final. I am thrilled. It has been a tough season. Chelsea have won the league but will have a bit of a downer now. Arsenal have had a terrible season but have now won the FA Cup and they will go into the summer with a bit of an upper. Arsene Wenger has won the FA Cup seven times, more than any other manager in history. 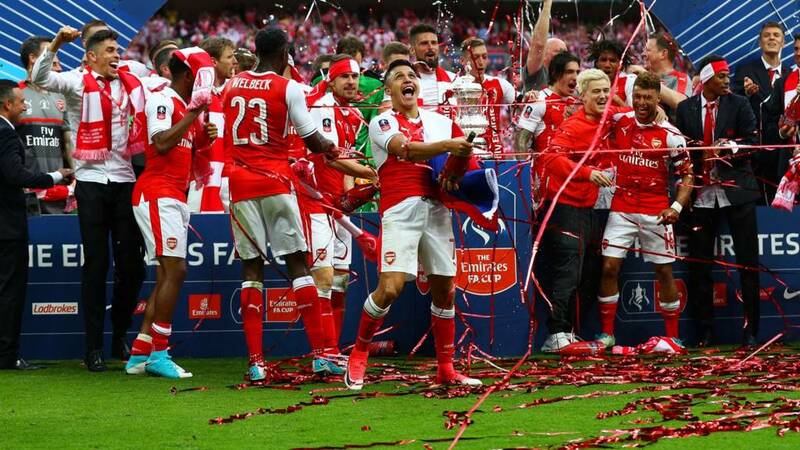 The Gunners have lifted the trophy in each of their last six FA Cup final appearances and they have now beaten Chelsea twice in a season for the first time since 2003-04. And here he is, Per Mertesacker alongside Laurent Koscielny, lifting the FA Cup for Arsenal. It was a fantastic game. Arsenal thoroughly deserved to win, they were a yard quicker. I know Alexis Sanchez was awarded man of the match, but what about Per Mertesacker? He hasn't played 90 minutes all season, and he was absolutely magnificent. How crucial was this save by Ospina? So many big moments for Arsenal's defence. It was a brilliant game, end to end from start to finish, and the best team won it. This was one of Arsenal's 16 shots in the FA Cup final. Arsenal goalscorer Aaron Ramsey on BBC One: "I can't describe this. It's been an up and down season. We've finished with the FA Cup so it has to be successful. "I've got the winner again. I love this competition. The boys deserve this. I'm happy for the manager. To get another FA Cup - delighted." On manager Arsene Wenger's future: "Of course I want him to stay at club. He deserves this. We changed the formation and had a lot of success. Fair play to him, he changed the system. Hopefully, he'll be there next season."